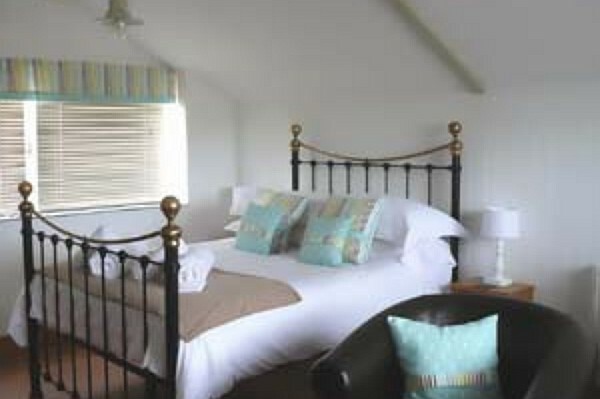 This 4 star romantic cosy studio is on Merlin Farm surrounding by beautiful Cornish countryside and within walking distance of the Mawgan Porth Beach a popular surfing spot. 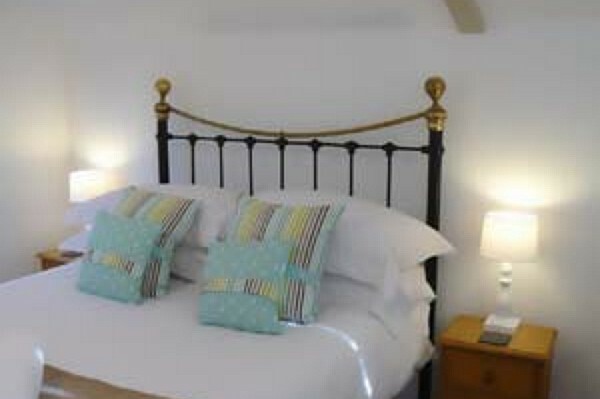 The cottages at Merlin Farm were awarded as being "one of the top 50 Best British Escapes" by The Independent. The Farm at Mawgan Porth is brilliantly situated within walking distance of Watergate Bay where you can enjoy a the expansive beach, some of the water sports on offer as well as Jamie Oliver’s Fifteen restaurant. There are many other popular tourist attractions nearby including Padstow with its winding streets, classic harbour and Rick Stein’s world famous fish restaurant. The studio is all on one level. There is a cosy bedroom/lounge with a double bed, wood burning stove, dining furniture, armchairs and TV/DVD player, Hairdryer and Iron. 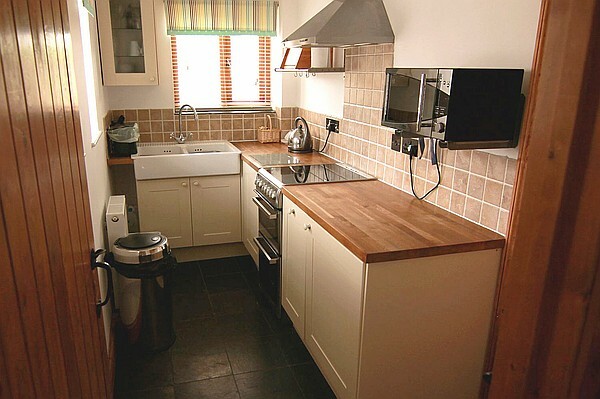 A well equipped kitchen with a fridge, oven with ceramic hob, grill and a microwave. 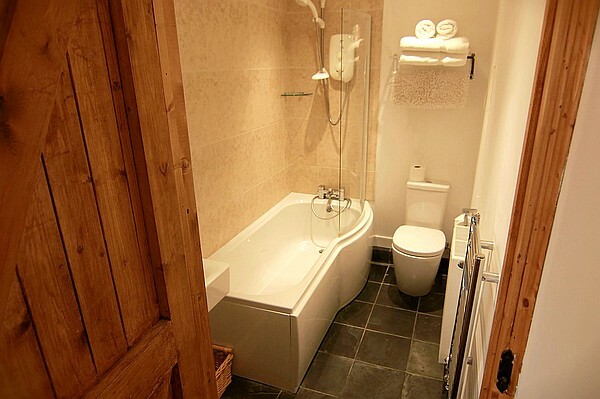 And also a small bathroom with shower/bath and toilet. 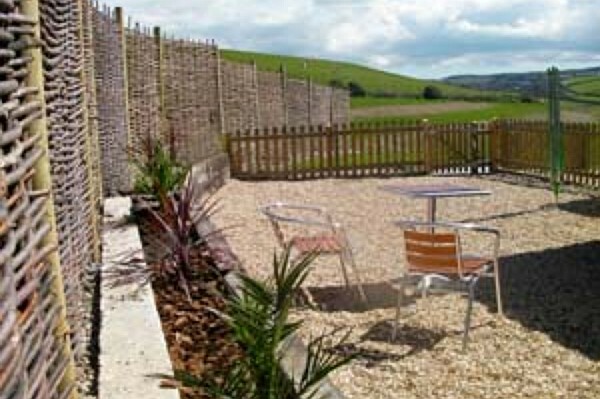 Outside the property there is a fully enclosed gravel garden, with garden furniture and rural views. Mawgan Porth Beach – A 15 minute walk away along a wooded track and a public footpath is Mawgan Porth Beach. The Beach has been awarded The Times 6th top European beach and is very popular with tourists. 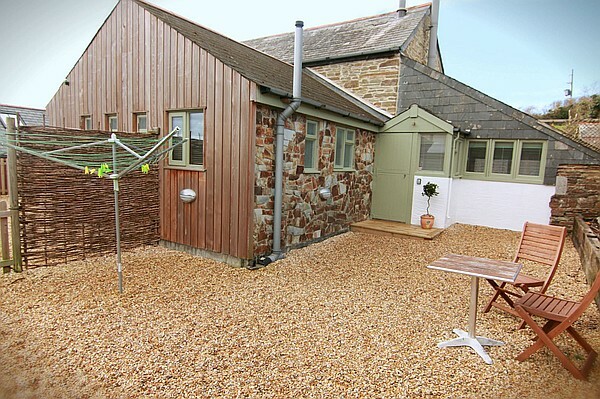 Watergate Bay – Is just 2.4 miles away from the Farm. It is a very large beach great for dogs and children to let of some steam. There are many water sport activities on offer at the beach and a number of restaurants and eateries, one of which is Jamie Oliver’s popular Fifteen restaurant. Newquay – The lively town of Newquay is 5 miles away from the Farm. There are many busy bars and restaurants ad a popular beach. Padstow – Is one of the most popular villages in Cornwall famous in part for Rick Stein. It is just over 8 miles away. In Padstow there are many winding streets with lots of independent shops and restaurants. Kingsurf – Is a very well regarded surf school catering for all abilities based on Mawgan Porth Beach. Exteme Academy – Offers kite surfing and traction kiting on Watergate Bay. Segway – Is great as its open to all ages and abilities, there are two centres nearby in Newquay and Helston. The Eden Project – Is Cornwalls most popular attraction, it is 18.6 miles from Merlin Farm. At the centre there is an indoor rainforest and many one off events and exhibitions . For those of you who’d like a unique view of the centre there is a Skywire giving you a bird’s eye view of the forest. Outdoor Laser Tagging –Big Dunks is based at Delabore and has all the most up to date equipment, they boasts a range of up to 400 yards. Karting - A short 5 minutes drive away is the St. Eval Kart Racing Circuit. Horse Riding - Reen Manor at Perranporth offers a wide range of rides to people of all abilities. ​​Coasteering - Is a mixture of both scrambling and rock climbing which has continued to grow in popularity. Hotrocks in Newquay will enable you to really explore the Cornish coastline. Old Macdonalds Farm – Is a charming small family run farm yard centre, it’s a really popular day out with young children. Crealy Adventure Park – Is Cornwall’s biggest theme park. There are numerous fairground rides, a farm yard, children’s adventure playgrounds and mazes. Blue Reef Aquarium –Is a large Aquarium in the centre of Newquay with a large range of sealife. Newquay Zoo – Is an award winning zoo with over 130 species. Lappa Valley – Is a very quaint leisure park, accessed by a 2-mile steam train trip. When you arrive at the park there are paddle boats, crazy golf, miniature railways, a crazy golf course, maze, playgrounds, canoes and a woodland walk. The Park – Is a holiday park within walking distance of the farm where there is a swimming pool ideal for young children. Walking – The Farm is set in some glorious countryside which is easily explored on foot. From the farm you can walk to Watergate Bay, Padstow, Carnewas and Constantine. Golf – There are several golf courses easily accessible from Merlin Farm, the closest are at Merlin, Treloy and Trevose. National Trust Properties – Cornwall has an extensive range of stately homes and stunning gardens. Easily accessible from the farm are Lanhydrock and Trerice. We welcome dogs to Merlin Farm but regret that we cannot except them at our cottages between 26th July and 30th August. We have a few rules for our canine guests which we would be grateful if you could follow. We request that dogs are not left alone in the properties as they can become distressed in unfamiliar surroundings, that you tidy up any dog mess (using the eco dog poo composter), that you keep dogs (due to the other animals) and that all dogs are fully vaccinated. All Bedding and towel (ex beach towels) are included. A charge of £10 for dogs is made and we regret that dogs under 12 months are not allowed. Unfortunately we cannot accept dogs from 26th July to 30th August. At the time of booking a 25% deposit will be taken and a £50 security deposit.